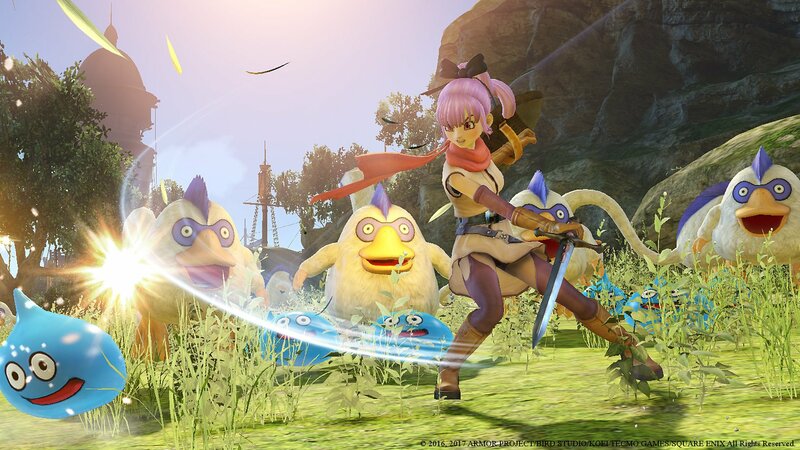 On the whole, Dragon Quest Heroes II is a mighty success and one that I'll definitely keep coming back to as the year unfolds, even if it’s to simply put a big smile on my sorrowful brow. You’d be hard pressed to find something as big, bold and unabashedly barmy as Omega Force’s newest hack-and-slasher battle-em-up Dragon Quest Heroes II. Like a rabid Chimaera frothing at the snout, this Musou-style action-RPG is without doubt as batshit crazy as they come — there’s a Mud Mannequin monster in it that attacks you by forcing you to get down and boogie on the spot for crying out loud! If that doesn’t get you excited, then what on earth will? Once again the longstanding peace between the Seven Realms has crumbled and war has gripped the continent. The King of Dunisia has been assassinated and due to this mysterious murder, the domino effect of war is in full swing. The only way to bring peace to the continent is to unify the Seven Realms and unearth the identity of the King’s killer along the way. In essence, there’s going to be a lot of huge battles all in the name of peace. Stop me if you think that you’ve heard this one before. Though the overall core narrative is only remarkable in how unremarkable it is, the likeable cast of characters, sharp-witted dialogue and top-notch voice acting, all coalesce to really help bring the whole experience to life. There’s an air of confidence in the way the game delivers its pulpy, zany, borderline silly brand of The Lord of The Rings meets Dragon Ball Z sense of humour and swagger, and though on paper that sounds like a disaster waiting to happen, Omega Force makes it work, and makes it work surprisingly well. New heroes come thick and fast, along with some cheesy but amusing one-liners. Traditional archetypal personalities are the order of the day, though they’re handled deftly here by virtue of how unusually amiable they all are. The spritely central protagonists (whose names can be altered at the start of the game) are peppy, endearing and charming, and the raft of new individuals who join your burgeoning party are either charismatic, sympathetic or a blend of both. It’s a real challenge crafting a likeable cast of individual characters, and Dragon Quest Heroes II delivers on this front, with aplomb. Onto the gameplay and thankfully there’s a whole lot to love here, too. The core moment-to-moment action is, in a word, chaotic. There are a dazzling number of enemies on-screen at any one time, and there’s a huge amount of monster variety, all with their own specific special attacks and weak spots. Hitting critters charges your Tension meter, and when maxed out, your heroes can unleash a unique and devastatingly powerful coup-de-grâce maneuver that assaults all the enemies on the screen. Though the ridiculously over-the-top cut-scenes that play out when your heroes let loose get a little repetitive, it always feels awesome and can often change the tide of battle in a really significant way. Now, I say heroes – plural – as you can actually take control of each of your party on the fly. It’s nice being able to change up your arsenal at the touch of a button, as the majority of your squad have their own suite of distinctive, personalized move-sets that help switch up the action gameplay. If you’re interested in swapping your main protagonist’s class to something a little bit different, say an archer or a mage, then a quick visit to the Priest in the Accordia hub world is all you need. However, this comes with the rub of resetting your base stats back down to level one. Unfortunately, your current stats don’t carry over, which is a little bit irksome for those who want to take their main character in a different direction with another class entirely. It’s by no means a deal-breaker, but I’d advise choosing a class early on and sticking to it. No one wants to have to restart at level one late in the game. Furthermore, there’s a pretty nifty mechanic called Proficiency that actively rewards the characters that you use in battle by gifting them with fresh, new passive and active abilities, skills and powers. All you need to do is visit the Martial Master in Accordia every so often to unlock these marvellous newfangled rewards and reap their freshly discovered benefits. It also helps that he’s a bit of a cool dude in a Mr. Miyagi-esque kind of way, which is all the more reason to pay him a visit. As you make your way through each sweeping battle, adversaries occasionally drop Monster Medals which enable you to spawn critters to fight by your side. These come in three distinct flavours: Sentries hold their ground and battle for you autonomously until their health runs out, Saviours summon minions to support you using their trademark moves but vanish promptly as soon as they’re done, and Substitutes let you temporarily take the form of a monster and use their unique destructive powers to wreak havoc on the battlefield. The latter Monster Medal is a new addition in this sequel and a pretty refreshing twist to the formula — few things in life are as satisfying as trampling all over a frenzied posse of nasty beasties as a giant stone golem. Some of the large-scale battles are exhilarating, but things can occasionally get a touch disheartening, particularly in the later more sizeable conflicts. There are sometimes seven or eight sub-battles, each with their own individual objectives, that all need to be completed and if you fail on the final step, then it’s back to the beginning for you. This can result in losing up to thirty or forty minutes of progress. Some kind of save system between each sub-battle (especially for scrubs like me) would have been really appreciated, but it’s thankfully not a huge issue and can be sidestepped with a little patience. 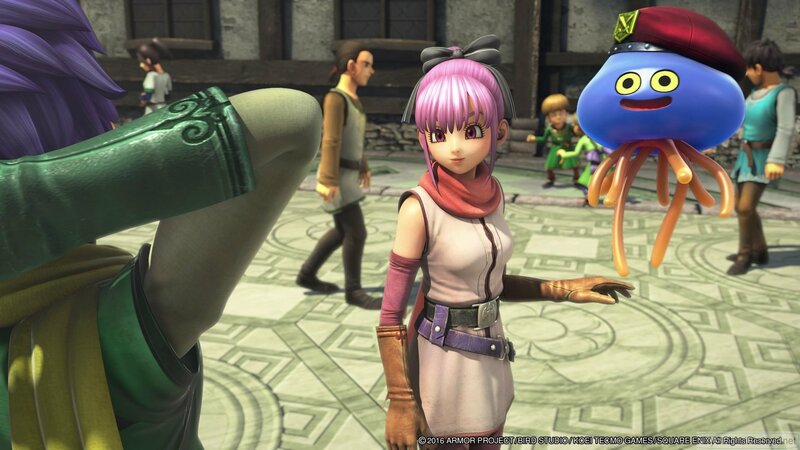 What’s pretty surprising about Dragon Quest Heroes II is the depth of some of its RPG elements. In the Accordia hub world there are a handful of handy vendors to visit and these can be used to take on new quests, buy souped up weapons, purchase better armour (referred to in-game as orbs) and enhance accessories, to name but a few. There’s a dizzying number of skill trees that not only dramatically improve your stats, but unlock fresh, new abilities and skills, not only for each individual hero, but for your party as a whole. These Party Powers give your squad an extra layer of customization and can give your team a few more helpful passive buffs, too. Further still, there’s even a co-op multiplayer option which sees you and up to three friends take on challenging bosses and dungeons, however, at the time of writing, myself (and another colleague of mine) couldn’t get into a lobby for that sweet co-op action. Hopefully these matchmaking issues will be ironed out early in the launch week. Finally, the title’s presentation is excellent across the board, with slick, gorgeous animations, beautifully rendered, varied environments popping with vibrant colours, and some pretty cool creature designs, too. The game’s audio design is fantastic, with a foot-tapping score that will get wedged deep within your brain (the Accordia town theme is playing in my head as I write this). It’s littered with catchy ear-worms and iconic jingles and is overall a joy to listen to. Like a kid chomping into their very first sugary candy bar, the game’s outrageously over-the-top action is a rush that’s doled out to the point of sensory overload. It’s often excessive, completely off the wall and feels a little too syrupy for its own good. But, somehow Dragon Quest Heroes II pulls these eccentricities together and nails them with a sly, cheeky wink and a tip of its hat by being a surprisingly deep RPG to boot. On the whole, it’s a mighty success and one that I will definitely keep coming back to as the year unfolds, even if it’s to simply put a big smile on my sorrowful brow.